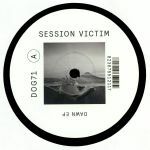 Review: This 12" marks the debut of Session Victim's new label Pen and Paper, an imprint that appears almost ten years to the day from the duo's first 12" release. 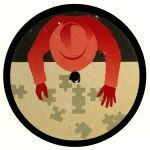 Title track "Puzzle" is a little darker, woozier and more intense than much of their work, with ricocheting percussion hits, moody chords and jazzy, jammed-out electric piano motifs rising above a locked-in, late night groove. It's accompanied on side A by a deliciously deep, Twin Peaks-goes-deep-house remix by Giegling regular Vril. Iron Curtis takes control on the B-side, serving up two fresh reworks of Puzzle. Choose between the breakbeat-driven, Balearic-minded deep house positivity of the Broken Flowers mix (B1) and the tactile, spacey and synth-heavy bounce of the classic Detroit techno influenced Passagen Mix.